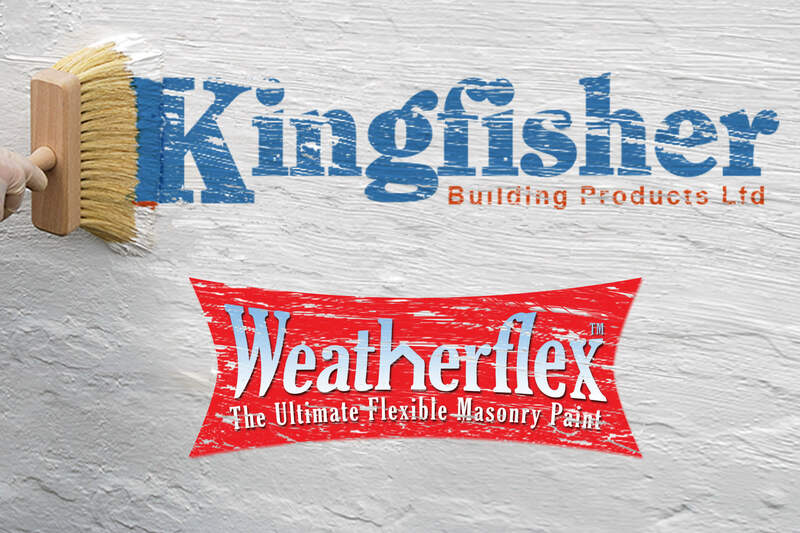 Kingfisher's premium grade breathable Weatherflex Masonry Paints have been protecting Lakeland homes in all seasons and weather conditions for over twenty years. This masonry paint was originally developed as a flexible, waterproof coating, sympathetic to our unique Cumbrian fell stone. 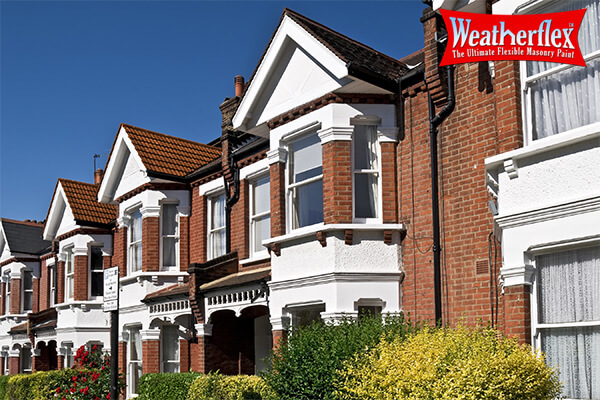 Due to its quality, Weatherflex has earned a national reputation for durability, weather protection and depth of colour. Exterior walls are regularly being exposed to the British climate so they can look untidy and unloved. For long term quality, our Smooth Masonry Paint will ensure your exterior surfaces will look outstanding for many years. The protection that this paint provides is second to none and will guarantee to give you fantastic coverage. Our broad expertise in the field of structural waterproofing has always been heavily influenced by our Lakeland location. This which has been so instrumental in the continuous testing and improvement of our products. However, our flexible exterior masonry paint in particular has benefitted from years of development in this harshest of nature's proving grounds. Our latest range of high-performance Exterior Masonry Paints therefore represents a culmination of incremental technological progress. 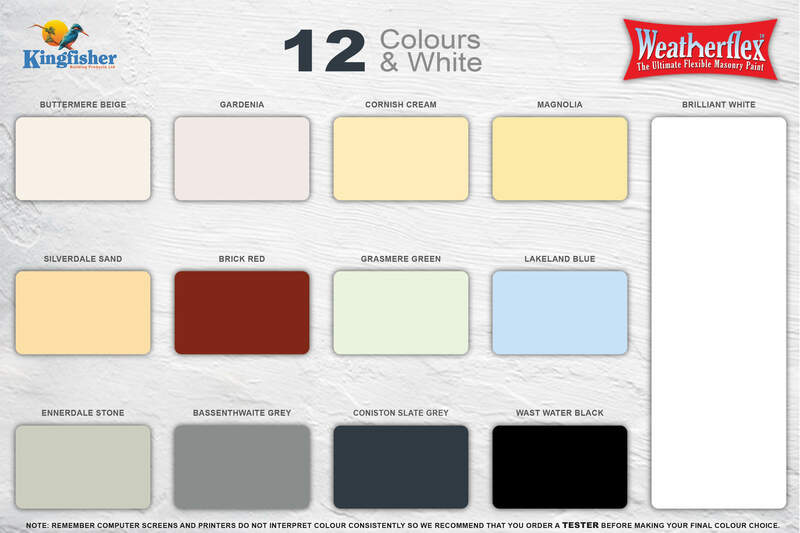 Our selection of flexible exterior masonry paint features new colours inspired by the Lakeland landscape. The demanding climate and raw beauty have been so integral to the development of the Weatherflex range. From the coastal sands of Silverdale to the depths of Wastwater, there are colours to inspire any project. Remove all existing loose paint either chemically with paint stripper or with a wire brush and scraper to make sure that you have a sound surface onto which to apply the "Weatherflex". It is not necessary to remove all existing paint – that which is still well bonded to the surface will normally provide an adequate base for "Weatherflex". Where green mould, lichens and moss have taken hold, spray or sponge thoroughly with Kingfisher "Bio Wash" to kill off the visible "green stuff" and also the invisible roots and spores which are embedded in the substrate. This is very important and will prevent re-growth underneath your new coating. 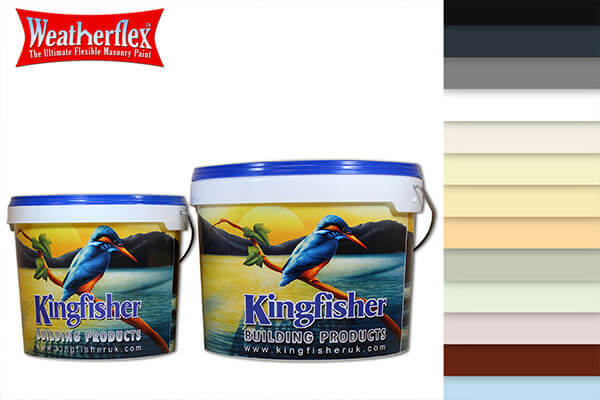 Carefully examine the mortar joints for signs of decay and rake out any crumbly areas and re-point adding Kingfisher "Pointing Solution" to the mix for waterproofing, flexibility and adhesion. Pay special attention to repair of chimney stacks as these are a frequent source of moisture ingress. Phone us if in doubt. In a bucket mix ONE part sharp sand, ONE part ordinary cement with neat "Pointing Solution". This should be paddle mixed with a drill (400 to 600 rpm) until a "yoghurt consistency" is achieved. You then brush or stipple this grey primer onto the area with a masonry brush or similar. Leave this for around 20 to 30 minutes. Mix up a stiff repair render of 1 part cement to 4 parts sand mixed with "Pointing Solution" and a little water. It is important to apply the repair render within half an hour of the primer mix to ensure "continuity of key". This method avoids the usual shrinkage cracks and "falling out". Where stone, brick or mortar may be slightly friable or "soft", such surfaces should be primed with "Weatherflex Stabilising Solution" to harden the surface and improve the adhesion of the "Weatherflex" coating. The same treatment should be used for "dusting" surfaces and flaking paint which cannot be adequately removed by wire brushing. "Weatherflex Stabilising Solution" must be applied to any new pointing or re-facing repairs prior to coating with "Weatherflex" to prevent the alkalinity in the mortar from discolouring the paint (because although mortar hardens within 24 hours, it takes up to two months for full chemical cure!). Where the wall substrate is non-porous in nature (e.g. engineering bricks or granite stone) you should apply "Weatherflex Stabilising Solution" to improve adhesion. If in doubt a small test area of both stabilising solution and paint should be applied to check compatibility with the surface and if possible left to weather. Note: This is especially important if there is a possibility that the surface might previously have been treated with a clear water repellent or similar. 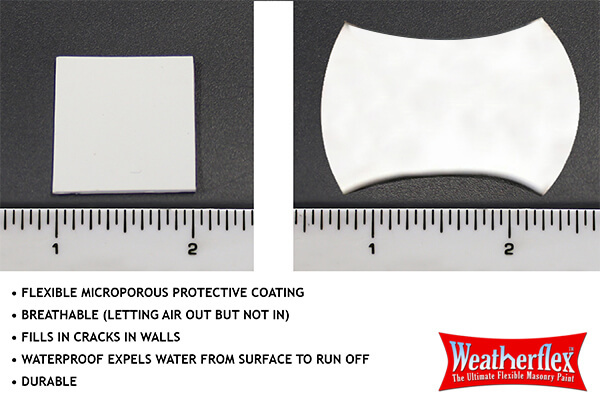 "Weatherflex" requires 2 coats and can be applied by brush or roller. Apply with broad, even strokes and avoid "loading" the brush or roller, especially on the first coat. It can also be sprayed with some DIY sprayers but for high pressure spraying our "Kolourseal wall coating" range is specifically formulated for professional contractors. It is recommended to coat one elevation at a time and check the batch numbers, ensuring that tubs from the same batch number are matched up for the top coat or at least per elevation. Do not apply in temperatures below 8 °C. Always buy a tester pot to check the colour suitability BEFORE ordering the full size container(s). The coating should be applied using brush or roller, aiming for a coverage of 8-10 sq mtr/litre for smooth surfaces and 4-6 sq mtr/litre on rough surfaces. Do not use outside when conditions are below 5 deg C over 24 hours or if rain is imminent. The paint will be touch dry in approx 2 hours, allow 4-6 hours between coats. Clean all brushes and rollers immediately after use in warm soapy water. What is the estimated lifespan for "Weatherflex"? If the surface is prepared correctly in accordance with the data sheet and regularly maintained, "Weatherflex" will last for 15 years. Does the surface need to be dry to apply "Weatherflex"? The drier the better to ensure good adhesion to the substrate. Do I need to use a primer before applying "Weatherflex"? It depends on the condition of the surface to be painted. "Virgin" unpainted surfaces should be primed with "Weatherflex Stabilising Solution" to improve the coverage, adhesion and depth of colour of the "Weatherflex" paint on existing painted surfaces, spot apply "Weatherflex Stabilising Solution" to improve adhesion on areas where the old paint has flaked off during surface prep. What is the minimum temperature for applying "Weatherflex"? "Weatherflex" should not be applied at temperatures below 6 deg C or in damp I humid conditions. In winter especially always allow sufficient time (at least 4 hours) for the paint to cure before the evening dew point. I am painting a wet dashed wall, should I use the "WeatherfIex" Textured or Smooth? Textured "Weatherflex" is normally used to give a decorative sand effect to smooth or plain surfaces. Use "smooth" on pebble dash or textured renders. I ordered some Weatherflex Smooth Masonry Paint at 12.30pm it arrived at 10.20am next day, if the product is as good as the delivery time then this paint should be the best thing since sliced bread! I had had very good comments from friends and neighbours liking the colour. The paint goes on well and i'm pleased with the result.